Click above to view larger. Graphic: Metro. I’m not sure it’s a good thing for Metro to be bragging about how much it’s spending–after all, if it were possible to do these projects more cheaply, we could do even more with the same amount or spend that money on other priorities like affordable housing. The goal is mobility, not full employment for engineers. That aside, it’s fantastic to see LA County finally making a serious commitment to enhancing mobility, and I really hope that Metro can get another ballot measure passed to accelerate all this and fill in the remaining gaps. All great but these are just tax dollars used to construct these projects. Where is the money going to come from to MAINTAIN them once they are built? The buck doesn’t stop once it’s built, you need constant money flow to keep it in good shape. You know, like the Blue Line? This is an easy one to answer, increased revenue from ridership, These projects are needed, our streets are congested and as L.A. becomes more and more populated demand for new rail will always be there. Maintaining something is never going to be the same as the initial start up costs like the studies, planning and construction. We will all be happy once these things are built. Count the number of cars that go out of LA in a day and then count the number of riders and you will see that the Metro is a veritable minute drop in the bucket when it comes to relieving congestion. If you live in Sunland or Maywood where is your Metro. THERE AIN’T ANY. This metropolis doesn’t lend itself to trains. We all need to wake up and do the studies. Now count the number of trucks on the road and how much space they take up. Making truck travel happen at night is both quicker and efficient for traffic. Get rid of trucks during rush hours would relieve truck much better and cost nothing!!!!!!!!!! Gee, anything in there to improve TAPTOGO? ……………………… …………………. crickets ……………….. ………………. Just got my first senior discount card and Metro, without warning, created me a new impossible-to-remember user id. Apparently it is also impossible to transfer funds from the old card to the new one. Arggh. How about scrapping the entire $4.3 billion project put toward freeways and re-direct all of that money to more mass transit projects? Imagine what Metro could do with that $4.3 billion: install more fare gates, remodel stations, add a third track, update the TAP website, purchase more rail cars and buses, etc. etc. The real issue is this is how much taxpayers are footing the bill for these things that Asian transit agencies are able to do solely on profit earned. If Metro made a profit like Asian transit companies, they wouldn’t need taxpayers footing $14 billion dollars to build transit infrastructure plus who knows how much it’ll cost for maintaining them once built. 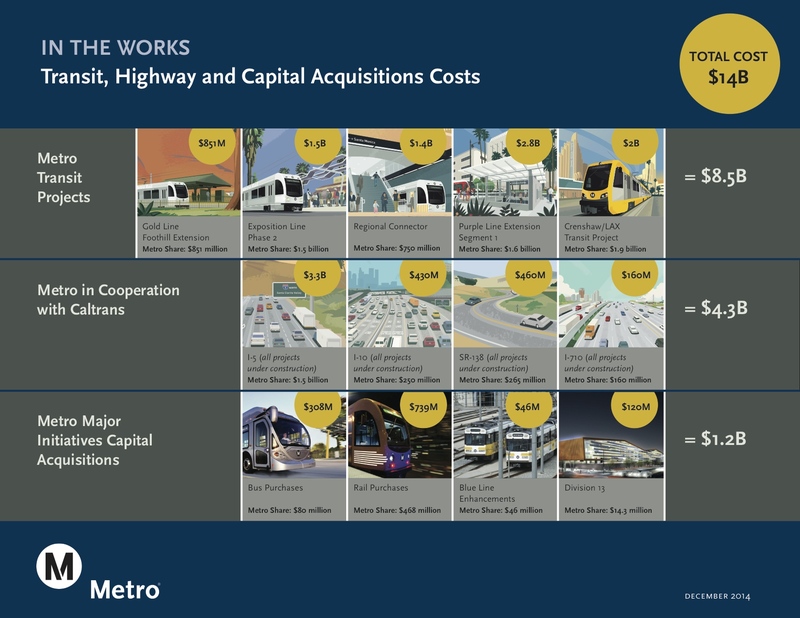 The funding for both construction and maintenance would come solely from Metro’s own profit gains. Said $14 billion in taxpayer money then could be used elsewhere like better schools, police, and water reclamation to fight the drought. I think it’s also safe to say that most transit agencies across the planet are funded in large part by taxes and fares — i.e. from taxpayers. There may be differences in the amount of taxes that some agencies need, but I think in the vast majority of cases, taxpayers are footing the bill one way or another. I also think that the services that Metro would provide if it was a for-profit enterprise only would be very different from the current situation in which the agency foots the bill for services to help provide people from many different walks of life with mobility options. Certainly that model or idealism doesn’t seem to be working where constant fare hikes are concerned. Every US transit “agency” has this problem. Cutting service, fare hikes, or increasing taxes. Those are the only three options transit “agencies” in the US have to keep their systems running. Even New York, the best the US can offer, has this problem. Fares in New York is now $2.75 per ride. How fair is it to charge $2.75 per ride for the most vulnerable of society, where people are forced to pay that much just to go buy milk at the neighborhood supermarket? And you know it’s not going to be and end to it. They’re already talking about $3.00 fares. LA Metro, you guys keep raising fares, increasing taxes and cutting services too. How can you say government agencies are doing their job fine? Compare that with fare models ran by transit “corporations” in Asia. In Seoul, fares start off at at about $1.00 for the first 10 km and goes up by $0.10 every 5 km. In Taipei, fares start off at around $0.60 and caps off at $2.00. And they never once raise their fares, they post 100% farebox recovery ratios, and they make huge profit without ever needing taxpayer subsidies. MTR in Hong Kong has a robust equivalent of Metro’s “joint development” program – their own development arm. Through exceedingly efficient operations, MTR recovers over 100% of operating costs through fares. By creating land near transit (literally – landfill in Hong Kong Bay) and developing developments near stations, some lines have their capital costs recouped through a combination of fares and “joint development”. Yes, Hong Kong is an exception, but I think Metro can learn from their “value capture” method of financing. Sounds like a great topic for an academic paper. The questions I would like answered are: 1) what would “exceedingly efficient” look like in L.A. County? 2) How much development does Metro really control near transit? As of now, it’s mostly limited to parcels left over from construction. I’ll definitely read the Atlantic article. Thanks for the link. The other question I have is this: Hong Kong has a denser population than L.A. County as a whole as well as the denser cities within our county — and parts of Hong Kong are extremely dense. I’m guessing that means car ownership rates are lower, translating to a larger audience for transit. Which leads to my question: doesn’t that kind of density give Hong Kong transit a boost that our region is a very long way from having? Seriously — would make for a good study, particularly on the Metro revenues side. A very important topic! So tell me again why we need government to run mass transit? If Los Angeles had the population density of Tokyo, our public transit might be profitable. Metro as a transit agency has no control over land use regulations that set maximum levels of density. It’s not fair to hold Metro accountable for land use policies that are out of its control. New York is the most densely populated city in the US. Many people ride the NYMTA over there than LA. Yet NYMTA doesn’t make a profit. You need gov to run mass transit because gov operates the roads, provides virtually free highways, and encourages the automobile through numerous other policies (parking requirements for buildings, etc.) in the face of a heavily subsidized infrastructure network dedicated to the car, no private enterprise could succeed in running a for-profit mass transit system. Odd, Asia does exactly that. Roads and highways are still built through taxes, but mass transit is run by corporations. The funny thing about distance based fare denialists is that while they are willing to believe all the scientists, professors, and economists who call for climate change, but turn a deaf ear to all the facts, the science, economists and professors with regards to mass transit issues who all agree that distance based fares are the most fairest and equitable fare pricing scheme that helps the poor who are not likely to travel far to pay less for shorter trips, while drastically increasing farebox recovery ratios. I mean really, how much more data and proof do they want? Do they think they’re smarter than these people who are experts in this field? Surely if they believe in all the scientists and professors about climate change, they can at least start learning and reading about the best experts in mass transit who have dedicated their lives to mass transit studies on their views of the best fare system. After all, who do you think knows more about mass transit? Politicians who are essentially blood-sucking lawyers, or scientists and professors in this field? 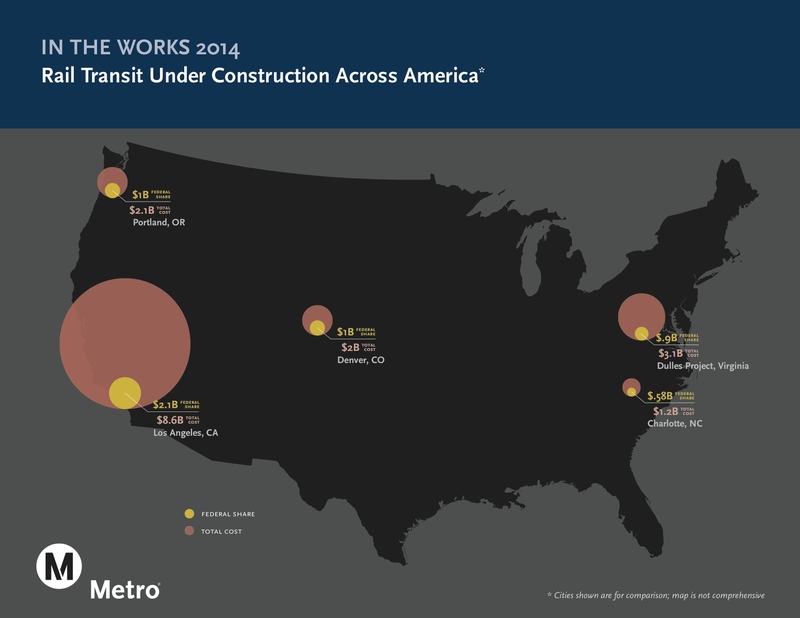 The map showing transit projects under construction is misleading. It appears that the size of the circles was changed so that the diameter was equivalent to cost. But these are 2-dimensional shapes, not lines, so the area looks very far off. For example, in Portland, the feds are picking up 1 billion out of 2.1 billion; but since the smaller circle is 1/2 the diameter, not 1/2 the area, it looks like the feds are only picking up 1/4 the cost. Similarly, estimating the size of the circles, it looks like Los Angeles is only getting a tiny fraction of funding from the federal government, since the area of the big circle is so much larger. But the numbers show the federal share as 2.1 billion out of 8.6 billion; almost 1/4. I would like to see more money towards the blue line: expand the blue-line, invest in its stations, invest outside the train stations. Once again, only certain areas seems to benefit.